My geobiology / biogeochemistry research interests include protistan studies of (1) “extreme” habitats and (2) deep-sea sediments, which comprise one of the largest ecosystems on Earth. More specifically, ongoing projects of the former include a mix of ecology, cell biology and molecular approaches to investigate cellular adaptations and symbioses in benthic foraminifera, ciliates and flagellates of sulfur oxidizing microbial mats (e.g., from silled basins, cold seeps). 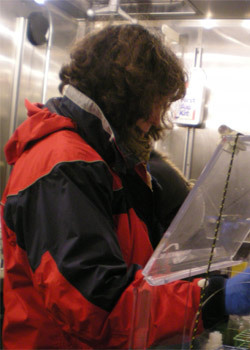 Ongoing projects of the latter use culturing and experimental approaches as a means to better understand paleoceanographic proxy (e.g., stable isotopes, trace metals) records of deep-sea benthic foraminiferal carbonate shells and the effects of ocean acidification on calcifying benthic microbiota.